Click the button below to add the MEMO PADS, NOTEPADS, SCRATCH PADS!! 24 Custom Full Color - $19.95 to your wish list. MEMO PADS, NOTEPADS, SCRATCH PADS!! 24 Custom Full Color 4-1/8" x 5-1/4" (25 sheets per pad). Your choice of wording, No limit to how many lines of type you would like, and absolutely no extra charge for a logo!!! Shipped Priority Mail® Medium Flat Rate Box (with 2-3 day expected delivery). You will be prompted to upload your file upon completion of checkout. 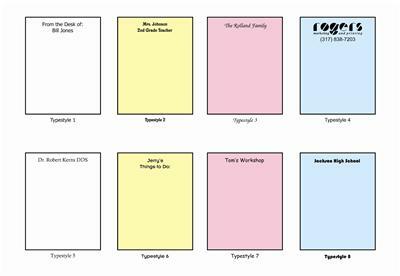 Personalized Note Pads, full color, 8 fonts to choose! *These memo pads make great gifts for teachers, grandparents, students, etc. etc. etc. *They can also be used for fund raisers. You won't be able to find higher quality personalized memo pads anywhere!!! Plus... they are inexpensive and we will fill your order immediately and ship them out next day. We do offer combined shipping discounts. Upon purchase you will need to email us your logo or line that you would like to have printed, as well as your color preference. Rogers Marketing and Printing has been serving our clients' printing, marketing, and mailing needs for over 31 years. The company was founded in Nov. 1980 by Jeff Rogers. He was a former State Sales Director for Master Developers, Inc. the founding company for the Signature Inn Motel chain, and Administrator of Methodist Occupational Health Centers. Rogers Marketing and Printing has continually grown and adapted to the many technological advances over the past 31 years. Our one constant over the years has been our ability to provide our clients with the best product in the industry. While many marketing and printing companies have come and gone, we have thrived by caring about what we produce and being honest with our clients. We are “The Marketing, Mailing and Printing Specialists”. *You can visit us on the web at www.rogersmp.com to see a list of over 160,000 different printing and promotional products we offer! Or call us at 1-317-838-7203 for more details. Great deal for memo pads! Arrived quickly, printed perfectly - everything I needed. Thanks! Very happy with the product - everything I'd hoped it could be and with record turnaround time!